After their playing careers have ended, many former NCAA athletes pick up the whistle to continue their involvement with the game. Here are eight former college hoops stars who are now running their own Division I programs. They come from various backgrounds levels of success. Some played in NBA All-Star games and for world titles while others toiled overseas keeping their dreams alive; many of them spent time in dark offices poring over film and writing scouting reports. All of them were grasping to hang on for as long as they could to the game they love. However, after their playing days finally expired, all of them have landed in a similar spot - as a head coach of an NCAA Division I basketball program. Here is a list of eight former college basketball players who have recently taken over their own programs. Steve Wojciechowski (Marquette, 1st Season): A fierce competitor, Wojo was a much ballyhooed player for the Duke Blue Devils and has received as much clout for his work as an assistant coach for his alma mater. Now he gets a chance to follow in the footsteps of Chris Collins, Tommy Amaker, and Johnny Dawkins (Quinn Snyder notwithstanding) as former Mike Krzyzewski players who now have their own major programs to run. Wojo spent 15 years on Coach K’s bench, perhaps waiting for just the right fit to make the leap to head coach. After serving as a Team USA assistant under Krzyzewski for several years, a job with Big East power Marquette may prove to be just the challenge the fiery Wojciechowski needs. Scott Padgett (Samford Bulldogs, 1st Season): In just his 6th year of coaching, Padgett takes over a Samford program for which he has been an assistant coach since 2012. After graduating from Kentucky in 1999, Padgett spent seven years in the NBA and one season in Spain. His quick rise to head coach began with an assistant coach position at Kentucky in 2009. After one season in Lexington, Padgett headed to Manhattan for a two-year stint with the Jaspers before landing with Samford in 2012. He takes the reigns of a program that won only 13 games last season. Star and won a Bronze Medal with Team USA in the 1988 Summer Olympics in Seoul. He later added a World Championships gold medal in 1994. Majerle served as an assistant coach for the Suns, who retired his #9 jersey in 2003, before taking over for Grand Canyon in 2013 as the school transitioned into a Division I program. He led the Antelopes to a 15-15 record and an entry into the College Basketball Invitational, where they lost to Pacific in the first round. Bobby Hurley (Buffalo Bulls, 2nd Season): Hurley is best known for his playing career at Duke University, where he led his Blue Devils to back-to-back national championships in 1991 and 1992. After surviving a near-fatal car accident his rookie year, he spent several years in the NBA with the Sacramento Kings and Vancouver Grizzlies. His coaching career consists of stints as assistant coach at Wagner and Rhode Island. His father, Bob Hurley Sr., is the renowned coach at St. Anthony High School in New Jersey. Hurley has one season under his belt with Buffalo, leading the Bulls to a 19-10 record and a first place finish in the Mid American Conference East Division. The Bulls received the 3rd seed in the MAC Tournament but were upset in their first game by Eastern Michigan. G. G. Smith (Loyola, MD, 2nd season): Smith, better known perhaps as the son of national championship coach Tubby Smith. He spent four years as a player at Georgia, three with his father as head coach, before following the same career path as Tubby. The younger Smith now enters his second season with Loyola, MD after spending several years as an assistant coach at 5 different schools. The Greyhounds suffered through an 11-19 campaign last season, including a 6-12 mark in the Patriot League. Jerod Haase (UAB Blazers, 3rd Season): Haase had been a long-time assistant with Roy Williams at both Kansas and North Carolina (he also played for Williams at KU) before getting a shot with the Blazers in 2012. In three years in Birmingham, Haase has amassed a 34-30 overall record but has finished under .500 (14-18) in Conference USA play. After leaving Lawrence, he attempted a professional career overseas but lasted just one season in Macedonia. Before taking up coaching, Haase, an academic All-American in college, co-wrote and published a book about his time with the Jayhawks. Sean Woods (Morehead State Eagles, 3rd Season): Woods, a former Kentucky Wildcats product, is no stranger to the big stage. He was on the floor during the famed Kentucky/Duke 1992 Regional Final game in which the Blue Devils’ Christian Laettner buried his Wildcats with a buzzer-beating turn-around jumper. Woods has been in coaching for 12 years, including a head coaching stint with Mississippi Valley State before landing at Morehead. Sadly, Woods is perhaps best known for physically confronting one of his players during a game against his alma mater. As Eagles faced off against his former Wildcats, Woods shoved and verbally undressed one of his players as he came off the floor. The event was captured on live television and earned Woods a one-game suspension. 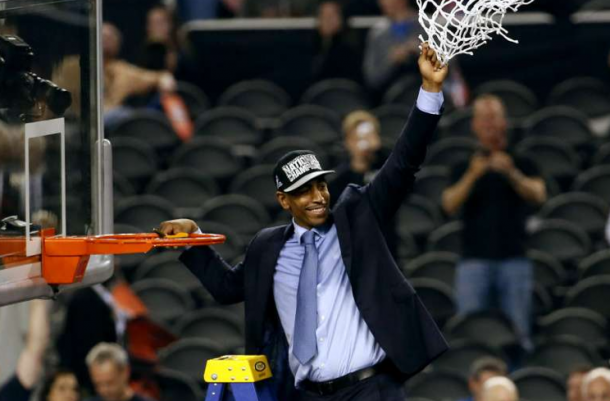 Kevin Ollie (UConn, 3rd Season): A longtime NBA traveler, Ollie became a national championship winner last season with the Huskies. After spending over 15 years as a professional, Ollie found himself as an assistant coach under Jim Calhoun, who he played for at Connecticut. In 2012, Ollie was offered the interim head coaching position with the Huskies after Calhoun resigned. In just two short years, he took a UConn team that was ineligible for post-season play (due to NCAA sanctions) to an unlikely national championship. Ollie’s popularity was at an all-time high this summer as he was rumored to be a candidate for the Los Angeles Lakers coaching position. He reportedly turned down the opportunity to jump back to the NBA citing his desire to remain with the Huskies.